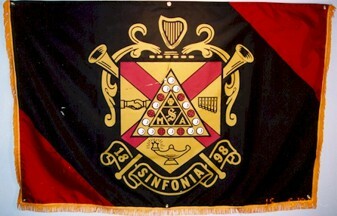 Phi Mu Alpha Sinfonia is a male fraternity in the US that focuses on males who are music majors. Information about this fraternity can be found at www.sinfonia.org/aboutus.asp. 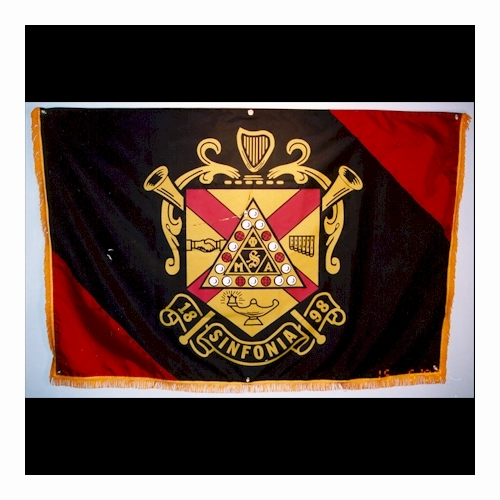 For the flag, it is the coat of arms of the fraternity on black background. At each corner there is a red triangle. A photo can be seen at sinfoniastore.org/Merchant2/productpictures/107011-FULL.jpg. I managed to make a gif image of the flag, using the arms image and colors from www.sinfonia.org/resources/vsmanual.pdf. I am not aware if the flag could have charges for chapter designation; Arkansas Tech University has a chapter of PMA Sinfonia but I have not seen any of their banners on campus.